Little has come down to us of John's early childhood. We gather from his mother's letters that he was strong willed and passionate. "Little Johnny's will needs constant curbing" and at four years old he was still unable to take his turn with his brother and sister in reading a verse round at family prayers, till the old nurse Chisnall took him in hand, and is taught him successfully from the first chapter of St John. He was considered backward, for he could not read at the age of three, as did his brothers and sisters! For the first 16 years of his life, Old Newton was John Bridges home, an out of the way spot, hidden in the tangle of Suffolk lanes. In a lecture on history, delivered at Shipley, Yorkshire, in 1882, he told his hearers, "in the village I was born in, faraway in Suffolk, out of the reach of steam engines, I remember well there was a weaver just as there was a blacksmith and wheelwright; and this weaver was also the village postman, and kept a small shop into the bargain". Elsewhere we are told that the blacksmith called himself Vulcan and his wife Venus, which looks as if evangelical Bridges had not penetrated the smithy! Refer also "Some Account of John Henry Bridges and His Family" by Francis H Torlesse. Companion to the Rugby Register. [1845 -1846]. Head: Archibald Campbell Tait. John Henry Bridges, son of the Rev. Charles Bridges, Old Newton, Suffolk, Second Rugby Exhibitioner, 1851, Scholar of Wadham College, 1851, Fellow of Oriel College, Oxford, 1855, Arnold Historical Prize, 1856. Bridges John Henry, 2s of Charles, of Old Newton Suffolk, cler. Wadham College, matric 7 May 1851, aged 18, scholar 1851, B.A. 1855; fellow Oriel College 1855-61, B. Med. 1859. see Fosters Baronetage. The Times (London, England), Tuesday, Jun 26, 1906; pg. 14; Issue 38056. A correspondent writes: "I have seen no notice in The Times, and very few elsewhere, of the death of a man who some years ago was regarded by his friends as one of the remarkable men of his generation. This was John Henry Bridges, F.R.C.P., for over 20 years medical inspector to the Local Government Board, but better known as one of the ablest of the English Positivists. he was the son of a clergyman, the Rev. Charles Bridges, and was born in 1832. 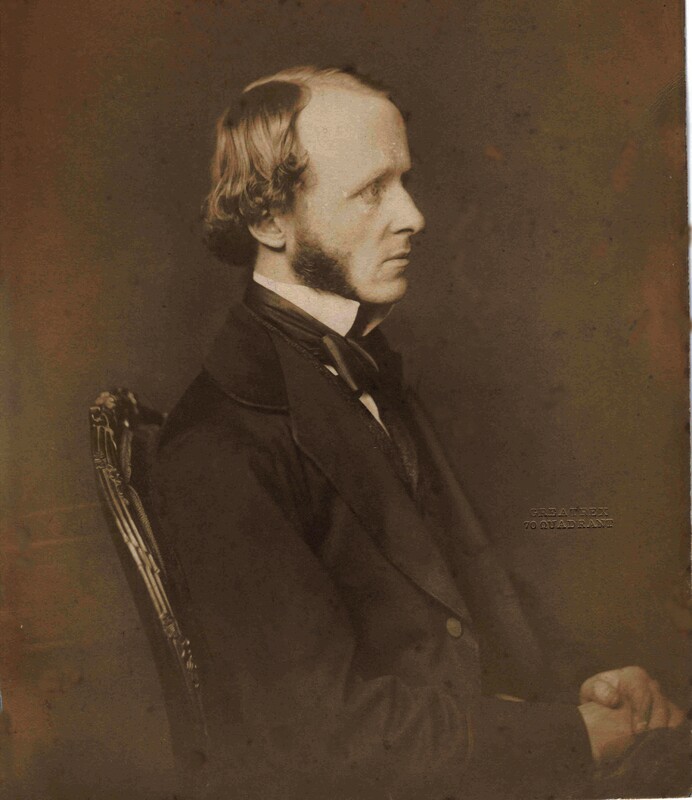 He went to school at Rugby under Tait, and then to Wadham College, Oxford, where among his contemporaries were two men who were destined to become his lifelong friends, and, with himself and their senior, Richard Congreve, to form the inner circle of the English followers of Auguste Comte. I refer to Frederic Harrison and Edward Spencer Beesly, of whom the former became Fellow of Wadham and a lawyer, and the latter a schoolmaster and subsequently professor of history in University College, London. Bridges obtained a Fellowship at Oriel, and adopted the profession of medicine, but after a few years of practice he accepted the appointment mentioned. The four friends, however, were better known as men of letters, and especially as the translators of Comte's 'Positive Philosophy' and the constant advocates of his doctrines and creed. The section of the book translated by J. H. Bridges was the "General View," and ten years later (1875) he collaborated in the translation of the 'Positive Polity.' He also wrote from time to time pamphlets and essays on practical political questions, treated, of course, from the Comtist standpoint. There were marked by singular clearness of style and by an absence of both the trenchant bitterness of Professor Beely and the somewhat excessive fluency of Mr. Frederic Harrison. Finally, Bridges published in 1897-1900 the book on which he had been engaged for years an edition of the 'Opus Major' of Roger Bacon. Unfortunately he had deferred it too long, for by that time his health had begun to fail, and he was unable to give sufficient care to the collation to the test or to the editing. It did not, therefore, satisfy the scholars, and it is to be feared that some of the review of it wounded him severely. For some years past Mr. Bridges was more or less of an invalid, and seldom visited his old London haunts at the Athenæum or elsewhere. He was of a shy, retiring nature, but the few people who knew him well had the highest respect and regard both for his character and his abilities. He died at Tunbridge Wells on the 15th inst." For more on John Henry Bridges, his and related families see "Recollections of John Henry Brooks MD" in the Books section of this website. 4. Census: England, 2 Apr 1871, St George Bloomsbury LND. John is recorded as head of house married aged 38 a physician not practising, a Poor Law Inspector born Old Newton Suffolk. 6. Census: England, 5 Apr 1891, Kensington Town Kensington LND. John is recorded as head of house married aged 58 a physician not practising, employed as Inspector of Local Government Board born Old Newton Suffolk. 7. Census: England, 31 Mar 1901, Paddington LND. John Henry is recorded as head of house married aged 68 a retired physician Inspector Local Govt Board born Old Newton Suffolk. 8. 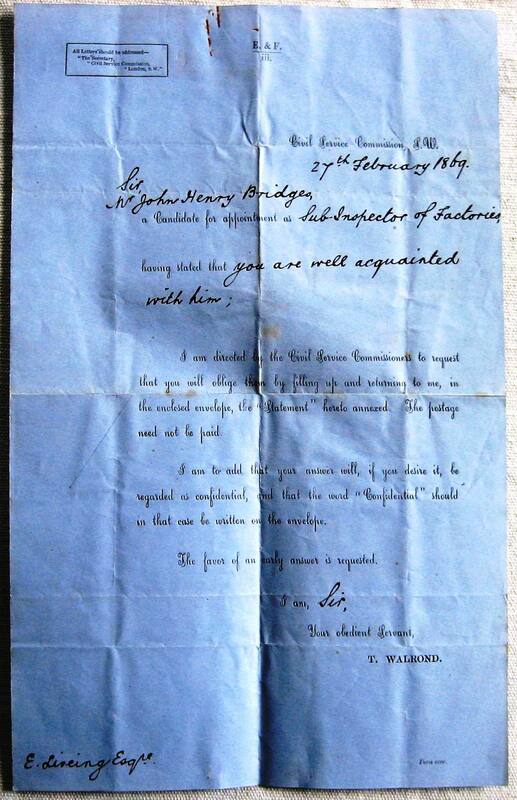 John Henry Bridges: Will 5 Jan 1897. I JOHN HENRY BRIDGES of No 28 Ladbroke Gardens Notting Hill in the county of London Esquire M B Fellow of the Royal College of Physicians hereby revoke all wills codicils and other testamentary dispositions heretofore made by me and declare this to be my last will and testament. On the 13th day of July 1906 Probate of this world with 3 codicils was granted to Mary Alice Bridges and Ernest Edward Bird to the executors. Bridges John Henry of 2 Park Place Gardens Paddington MDX died 15 Jun 1906 at 2 Woodbury Park Gardens Tunbridge Wells. Probate LON 13 Jul 1906 to Mary Ann Bridges Widow and Earnest Edward Bird solicitor.